The convention was called to order by Democratic National Committee chairman Augustus Schell. Henry Watterson served as the temporary convention chairman and John Alexander McClernand, a retired congressman and major general, served as permanent convention president. 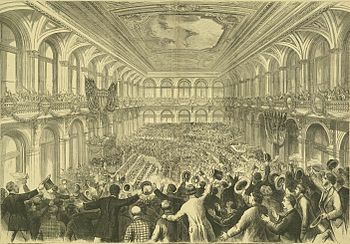 The 12th Democratic National Convention assembled in St. Louis in June 1876. Five thousand people jammed the auditorium in St. Louis, hoping for the Democrats' first presidential victory in 20 years. The platform called for immediate and sweeping reforms following the scandal-plagued Grant administration. Six names were placed in nomination: Samuel J. Tilden, Thomas A. Hendricks, Winfield Scott Hancock, William Allen, Thomas F. Bayard, and Joel Parker. Tilden won more than 400 votes on the first ballot and the nomination by a landslide on the second. Although Tilden was strongly opposed by "Honest John" Kelly, the leader of New York's Tammany Hall, he was still able to obtain the nomination. It is claimed that Tilden's nomination was received by the voting Democrats with more enthusiasm than any leader since Andrew Jackson. This page was last edited on 13 January 2019, at 02:52 (UTC).